"Feathergun" is a great progressive album from the underrated bad Rishloo. Yes, underrated pretty sadly, this band deserves more listeners, many people don't know this amazing band yet, but I really think it will be a matter of time till the band gets its good spot! Rishloo stands out from any other band due to its unique and strong vocals, going along with a great melodic sounding from the rest of the band, its heavy at times which really goes well with this band. The vocals are for the most part compared to Tool (my favorite band) at parts of some songs, which I can confirm, but both bands are completly different from each other and so are the vocal tune of each singer. Although "Eidolon" was a very good album, in my opinion Rishloo had a way better approach on the progressive world with "Feathergun", you can clearly see that they evolved a lot more with this album. Great and more mature sounding, smart music and overall good solid album. Highlights: "Turning sheeps into goats" , "Systematomatic" , "River of glass" , "Feathergun in the garden of the sun" , "Diamond Eyes"
Rating - 4 Stars: A excellent addition to any prog rock music collection. 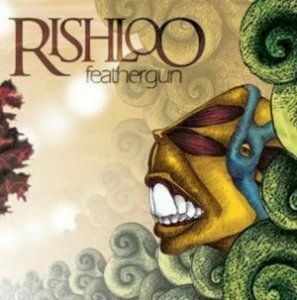 Even though the good things I've said above about Rishloo and this album, "Feathergun" has its flaws and the main problem I have with the album is the prodution. I really wish it was a lot better sadly, I hope this one day will be fixed because this album totally deserves. That said, not all the tracks on this album are great aswell, but you're still up for a great album. Rishloo are a band with a lot of future and can do even better records, that I am sure, I really want to see what they'll put out in the future. A great modern prog album which I highly reccomend.